The Oregon Wedding Showcase is happening in three weeks at the Lane Events Center in Eugene and I’ve already been inundated with requests for photography; brides are hoping to lock in their dates earlier and earlier every year! If you’re still looking for a photographer, or just want to score lots of free swag, stop by the showcase; I still have dates available. I’ll have a raffle at my booth (right next to David’s Bridal) and who knows what may be on offer 🙂 Last year I gave away a free engagement session. Here are some fun photos to remind everyone that winter will soon give way to spring, then summer! This year’s Oregon Wedding Showcase was a huge success and I want to thank all the brides-to-be who visited my booth. I’ve gotten quite a few bookings for 2016 (and 2017) weddings but I still have some dates open. If you’re still in the market for a wedding photographer, now’s the time! Get your Oregon Wedding Showcase tickets! It’s only 4 weeks until the 2016 Oregon Wedding Showcase at the Lane County Event Center in Eugene. I mentioned in my last post how to get 2-for-1 tickets to the show. Here is that link one more time! 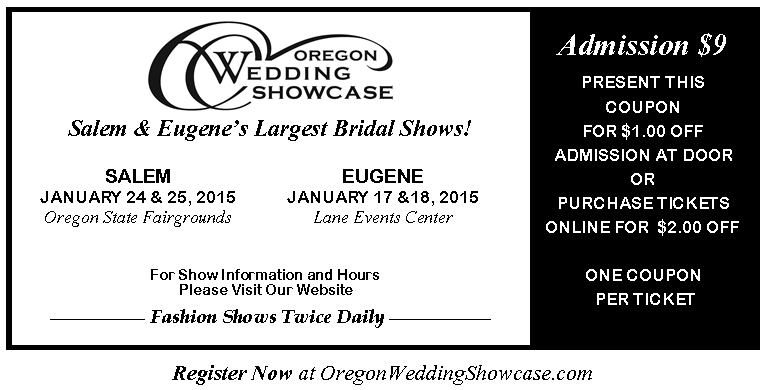 The 2016 Oregon Wedding Showcase takes place at the Lane Events Center the weekend of January 30th and 31st. For a limited time, Groupon is offering two-for-one tickets! Click here for the Groupon link. I had a booth at the Oregon Wedding Showcase last weekend and KMTR (channel 16 in Eugene, the NBC channel) was kind enough to use my booth as the only wedding photographer’s booth they showed on their newscast. Thank you, KMTR! Here is a screenshot of my booth, as seen on my own tv (yes, this is a photo from my iPhone, lol!). The Oregon Wedding Showcase is this weekend at the Lane County Events Center. Please stop by and visit my booth! For all couples who book with me during the Showcase, I am offering free wedding albums (see booth for details). Also, here is a coupon for the show! Simply print this out and bring it with you. This image below (since I can’t put up a post without a beautiful image to go with it!) is from a King Estate wedding I shot. I love the natural light.